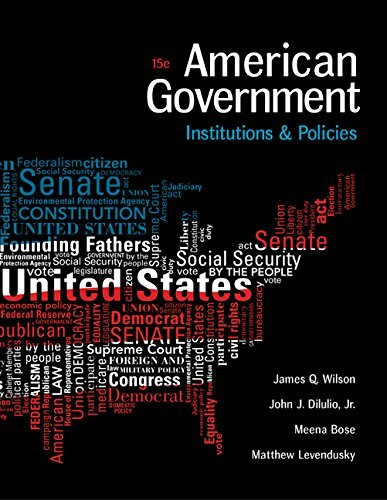 1305500059 -The reputable authors of AMERICAN GOVERNMENT: INSTITUTIONS AND POLICIES, 15th Edition combine excellent scholarship with practical examples and insight to create a text that is a clear and approachable tool for any student trying to understand the American government. This textbook highlights current issues in American politics focusing on the importance of American governmental institutions, the historical development of governmental procedures and policies, and who governs in the United States and to what ends. AMERICAN GOVERNMENT: INSTITUTIONS AND POLICIES follows a pedagogically proven course of study to maximize student involvement with the material. Highlighted key concepts, concise learning objectives, and features for practical application of contemporary debates on policy dynamics bolsters students’ comprehension.